As I continue to miss GenCon (for all meanings of the word miss), I have also started attending more smaller conventions. Last year I attended Carnage on the Mountain for the first time, and their organization has impressed me so much I had to attend again this year. Never mind that I get to see some folks in the past I have only seen at TotalCon (entirely my own fault as I regularly fail to show up to other scheduled gatherings), the fact is that the organizers of Carnage are both gracious and on the ball. I was politely asked over email if I was going to sign up for games, and when I did, I was again politely asked if I wouldn’t mind if one of my games was run in its backup time slot instead of its primary one as the backup time slot had fewer games. Geez, I fully expected that if they wanted to bump me they’d just bump me. Isn’t that why I enter a backup time slot? The extra care makes even a regular old DM like me feel like a special guest. It’s fantastic. So now Jenn and I are considering next year attending Origins instead of GenCon. In the past I’ve heard good things about Origins, but it’s just as far away as GenCon, so if I was going to a big con why not go to the biggest? The thing is, the biggest has now become too big. The frustration of trying to snag a hotel in the 1 hour window when they’re available, getting into barely any of the games I want, having to schlep several blocks from one building to the next to get to games… it’s just not worth it. As we’ve investigated Origins I’ve come to find some very heartening facts. Attendance last year was around 16k, which is still freaking enormous, but nowhere near GenCon’s 61k. Interestingly, my first GenCon in 92 had an attendance of 18k, which felt enormous at the time. From what I hear online, the most popular hotel sells out in about a month, and many hotels that are right next to the convention center will still have rooms available up to the last minute. This is quite a change from GenCon’s 1 hour scramble for housing six months before the show. But still, it’s GenCon… Do I really want to miss the 50th? 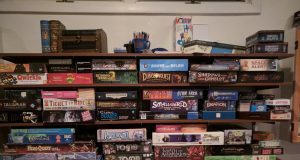 A few weeks ago I was grumbling about GenCon at an after-work gathering, and starting to sound like a grumpy old muppet. I wast trying to make the point that GenCon just didn’t feel like it was about the gaming anymore. Our recently graduated intern said “Oh, I didn’t even realize GenCon was a gaming convention, I thought it was an anime thing.” This is a video game company intern we’re talking about here people, not some uninformed person off the street. She’s well versed in all things geek, and honestly, if I wanted to go to an anime convention, she may be the first person I would ask for recommendations. And she didn’t even know GenCon was a gaming convention? So there’s my proof I think — GenCon simply isn’t the convention it used to be. It’s not a gaming convention any more. Nor is it an anime convention — it’s a new stuff convention. It’s a let’s wrap up every single thing geek culture is somewhat interested in and put a price tag on it convention. The GenCon I miss just doesn’t exist anymore. Geez, I feel like a widow trying to convince myself it’s time to date again. Sigh. OK Origins, let’s see what you have to offer.